General characteristics of this machine designed in a modular form are a thickness adjustable feeding unit which does not spoil the paste, easy adjustable sensitive cylinder system, homogenous flouring unit. 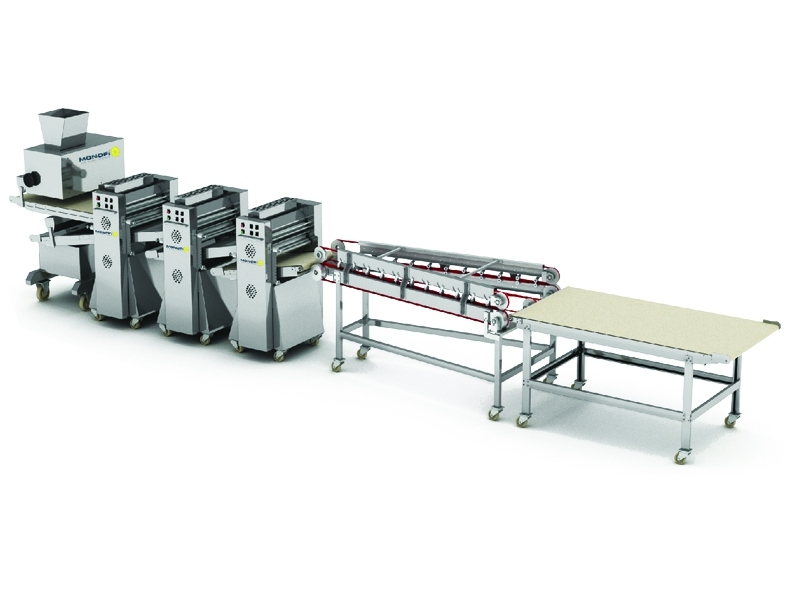 This line is manufactured for phyllo, thin breads and pizza pastes and it may be equipped with additional equipment according to the product to be manufactured. Since the system has a modular form, a new design may be obtained for new products.lt is easier to manage the machine through a sensor which prevents paste folding and accumulati-on, subsequent stop system, easily adjustable independent speed equipment. Like our other products, ali eguipments used h the machine manufactured by MONOFI quality were chosen as compatible for food production, easily interventable and cleanable. The machine was equipped with dense safety system completely.